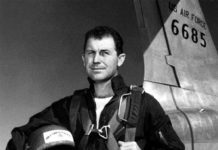 Wanna be the next Chuck Yeager? 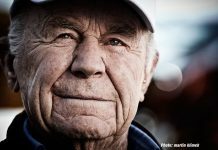 For many people, Chuck Yeager is a true hero in the strictest definition of the word. Throughout his career, Yeager displayed distinguished courage and performed several extraordinarily brave deeds, although he only considered such acts as following his duty. Many people recognize Yeager as the first person to break the sound barrier, but that feat is only one of his many important achievements. Without a doubt, Yeager is the world’s most famous test pilot not only because of the records he set, but also because of his determination, his ability to remain calm in difficult situations, and his ability to quickly analyze problems and find a solution. He is one of the “toughest” pilots, both mentally and physically, in aviation history, and few have ever matched his piloting skills. 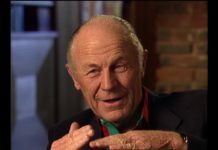 Charles “Chuck” E. Yeager was born on February 13, 1923, in Myra, West Virginia. The son of a gas driller, Chuck grew up working with a wide variety of mechanical devices. He could readily take apart an engine and put it back together without difficulty. A few months after his high school graduation, Yeager joined the U.S. Army Air Forces. Yeager had no real interest in learning to fly when he first joined the Air Forces. He simply wanted to be a mechanic. The main reason he enlisted in the Army was because the Army recruiter was more persuasive than the Navy spokesperson. Furthermore, unlike many famous aviators, Chuck’s first encounter with an airplane had left him unimpressed. When Yeager was a teenager, a plane made an emergency landing near his house. Although Chuck dashed over to look at the aircraft, he was unmoved by the experience. When Yeager entered the Army Air Forces, he seemed unlikely to become one of history’s legendary pilots. But, in the summer of 1942, he began showing an interest in becoming an aviator, thanks to the Air Forces “Flying Sergeant Program,” which trained enlisted men to fly. Yeager enrolled in the program because he wanted a change of pace, not to mention a promotion and a pay raise. Yeager earned his wings in early 1943. After a brief assignment stateside, he transferred to England and began working with the 363rd Fighter Squadron. In early 1944, on his seventh mission, Yeager shot down his first enemy plane. However, his next sortie did not go as well. On March 5, 1944, his eighth mission, Yeager had to bail out over occupied France after his plane took an enemy hit. Despite being wounded, Yeager still evaded the Germans, with the help of the French Resistance, and made it into neutral Spain. Soon after, he returned to England. Although military rules prohibited him from returning to his unit, he appealed his case all the way up to General Dwight D. Eisenhower, who allowed him to return to his squadron. In July 1945, Yeager entered a new phase of his aviation career when he became a maintenance officer at Wright Field, Ohio, a job that entailed flight-testing all of the field’s different planes. Due to his growing experience with a wide variety of aircraft, and his outstanding piloting skills, Yeager caught the attention of Colonel Albert Boyd, the man in charge of the Air Force’s aircraft testing program. Boyd invited Yeager to become a test pilot, and the West Virginian accepted the offer. Yeager’s next noteworthy flight occurred in 1953 while he was checking out the X1-A, a longer and more powerful version of the X-1. 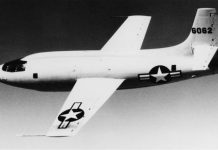 On December 12, Yeager piloted the X1-A to Mach 2.4, another record, although a short-lived one. 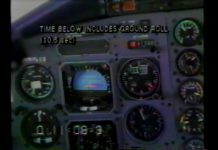 Even though most of the flight went according to plan, near the end, the aircraft unexpectedly started spinning out of control and began rotating on all three axes. In the process, Yeager smashed his head on the cockpit’s canopy. After spinning for more than 50 seconds, Yeager finally regained control of the aircraft and landed it safely, a fine example of his outstanding piloting skills. In 1954, Yeager left Edwards and accepted a series of command positions. His first stop was West Germany where he headed the 417th Fighter Squadron. Three years later, he returned to California as the commander of the 1st Fighter Squadron. After graduating from the Air War College in June 1961, he received a promotion to full colonel. The following summer he returned to Edwards to head the new Aerospace Research Pilot School, an institution that trained several of the Apollo and Space Shuttle astronauts. 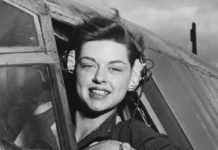 And notably, during this period, Yeager continued to help Jackie Cochran, the well known female flyer, learn the intricacies of various jets and support her quest to better several speed records, a mission he had begun in the early 1950s. Despite his workload as the commander of the Aerospace Research Pilot School, Yeager continued to test most of the experimental planes that came through Edwards. Although many of his flights went according to plan, one mission quite literally blew up in his face. In December 1963, Yeager was testing a Lockheed Starfighter F-104 when it unexpectedly spun out of control at well over 100,000 feet (30,480 meters). Although Yeager fought to regain control, he could not and had to eject at about 8,500 feet (2,591 meters). While ejecting, his pilot’s seat smashed into his helmet, tore open his visor, and the flame from his seat’s ejector rocket severely burned him. Although Yeager parachuted to safety, he required several skin grafts. The incident undoubtedly helped bolster his tough and determined reputation. 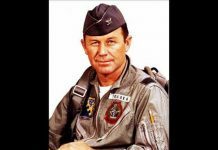 Yeager returned to military combat in July 1966 when he assumed command of the 405th Fighter Wing at Clark Air Base in the Philippines, which fought in the Vietnam War. During the conflict, Yeager flew a total of 127 combat missions. In February 1968, Yeager entered the final phase of his military career when he began commanding the 4th Tactical Fighter Wing. The following year, he received a promotion to brigadier general and became the vice commander of the 17th Air Force. Yeager had become one of only a handful of men who had started as an enlisted man and risen all the way to the rank of an Air Force general. Yeager formally retired from the Air Force in March 1975. During the 1970s and 1980s, he received a string of honors. 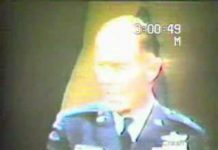 In 1976, he received the Congressional Medal of Honor for his first supersonic flight. Then, in 1985, President Ronald Reagan awarded him the Presidential Medal of Freedom. These two medals are the highest honors an individual can receive for outstanding service and achievement. 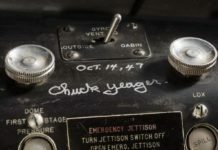 Yeager also obtained several other prestigious awards during his career, including the 1948 Collier Trophy, and the 1958 Harmon International Trophy, as well as numerous military citations. On October 14, 1997, the 50th anniversary of Yeager’s first Mach One flight, Yeager broke the sound barrier once again, this time in an F-15. That flight was his last official flight in an Air Force plane. 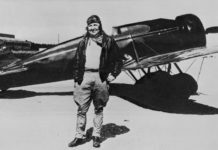 Yeager traveled a long and challenging path from his West Virginia beginnings to becoming one of the world’s most famous aviators. 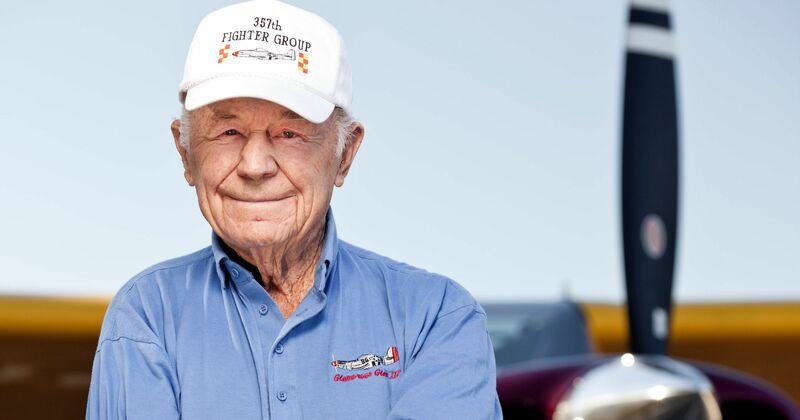 For many people, he exemplifies the true meaning of the word “hero,” not only as a record setter and pioneering test pilot, but also as a military aviator. Hallion, Richard P. Designers and Test Pilots. Alexandria, Va.: Time-Life Books, 1983. Supersonic Flight: Breaking the Sound Barrier and Beyond. Washington, D.C.: Brassey’s , 1997. Test Pilots: The Frontiersmen of Flight. Washington, D.C.: Smithsonian Institution Press, 1988. Janos, Leo and Chuck Yeager. Yeager: An Autobiography. New York: Bantam Books, 1985. Lundgren, William R. Across the High Frontier: The Story of A Test Pilot–Major Charles E. Yeager, USAF. New York: William Morrow and Company, Inc. 1955. Rotundo, Louis c. Into the Unknown: The X-1 Story. Washington, D.C.: Smithsonian Institution Press, 1994. Yeager, Chuck and Leerhsen, Charles. Press On: Further Adventures in the Good Life. New York, Bantam Books, 1988. Yeager, Chuck, et al. The Quest for Mach One: A First Person Account of Breaking the Sound Barrier. New York: Penguin Studio, 1997. Young, James O. Meeting the Challenge of Supersonic Flight. Edwards Air Force Base, Cal. : Air Force Flight Test Center History Office, 1997. Chuck had a flight 2013 in an F-15 from Nellis AFB to Edwards AFB for his 90th B’day. I was at Edwards when he landed…last official flight…Maybe. THIS WEEK IN HISTORY – OUT OF CONTROL! © COPYRIGHT 2019 / KLPSTUDIO.COM / KLAUS LARSEN. ALL RIGHTS RESERVED.